Jesus answered Pontius Pilate, "My Kingdom is not of this world. If my Kingdom were of this world, then my servants would fight to ensure that I wouldn't be delivered to the Jewish leaders. But, my Kingdom is not of this world." John 18:36 NHEB. 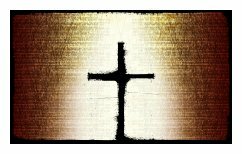 Welcome to our Easter Devotional and Easter Prayers page. The reason he could withstand the demonic and human attacks on his humanity was that he maintained his focus heavenward. Jesus modeled humility and bravery for us through his arrest and crucifixion for one reason: to accomplish his Father's will. That is our calling, as well. We're to glorify God with our lives. Keeping our future home at the forefront of our minds will ensure that we remain in service and fellowship with the Lord. Thanks for stopping in today. I think you'll enjoy the devotional and Easter prayers. Have you thought lately about the ultimate reason why Jesus came to earth? Jesus had a very specific purpose - a "mission from God," if you will. We often get hung up on the fact that Christ was unjustly persecuted and murdered. We act as if he initially came to live and succeed at the American Dream. Like he had to do with Peter, who tried stopping the worldly assault on his Master, Jesus also warns us, "Get behind me, Satan! You are a stumbling block to me; you do not have in mind the things of God, but the things of men" (Matthew 16:23 NIV). Our errant, misguided, unbiblical thoughts sometimes get us in trouble with the Lord! Here's the fact. Jesus came as a sacrifice for the sins of the world (John 1:29). He fulfilled the qualifications needed for that role by living a perfect life. Then he was led like a lamb to the slaughter, meaning his death was unwarranted according to worldly standards; but, warranted as the spotless sacrifice for heavenly purposes (Hebrews 10:5-6). If our blood boils thinking about the atrocities our Savior suffered we're totally out of line. Instead of blaming the Jewish leaders and Roman officials, you and I both need to march to a mirror and look at the real culprit. Let's accept the fact that our own sins betrayed Jesus, our own sins arrested Jesus, and our own sins convicted Jesus at an unjust trial. Let's admit that our own sins scourged Jesus and hung him from the cursed tree. Your sins, my sins, and the sins of all people who become saved are what killed Jesus. Our sins are what caused the greatest distress and pain to Jesus, as well, which was his horrific separation from the Father for several grueling hours, while hanging on the cross. Jesus Christ left his magnificent heavenly home, where he shared all glory with his Father, in order to die for you and me. Praise Him! 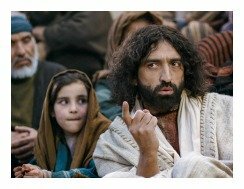 Immediately after Jesus scolded Peter (and you and me by association!!) he told his followers, "If anyone desires to come after me, let him deny himself, and take up his cross, and follow me. For whoever desires to save his life will lose it, and whoever will lose his life for my sake will find it. For what will it profit a man, if he gains the entire world, but forfeits his own soul? Or what will a man give in exchange for his life? 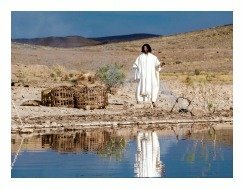 (Matthew 16:24-26 NHEB). Many people don't begin to understand the extent required for a real commitment to Jesus Christ. Nor, sadly, do they begin to understand the value of his or her own soul. Both these failures are terrible tragedies. Your beautiful soul is eternally loved by God and his Son, and they have done SO MUCH for you. Do you realize it? It's all laid out in the Scriptures, so I hope you've read all about it. If people don't read, it follows that they don't care enough to learn the truths God gave them. That is foolish and fatal. The one truth you must fully understand, so that your soul and body will live forever with Christ, is that you must believe fully in Jesus Christ (John 6:29). You must believe that He is the only Way, the whole Truth, and the eternal Life (John 14:6) by which you can be forgiven by the Father. There are NO other ways to God. It's more than simple mental agreement, though, it's a life calling (James 2:19). Jesus tells you to "take up your cross, and follow me." You must, deep in your heart and soul, die to the world and its treasures. You must place your love for the Lord above all other people, places, things, and interests. Can you do it? Will you do it? Jesus gave up everything for you. He was sacrificed for you. He rose from the grave for you. He wore your stripes, bore your shame, paid for your sins, and finally... finally... he will eternally bury your sins in the deepest part of the sea IF you "come and follow him." I gave my heart to the Lord during Easter, 1994, and He answered my personal sinners prayer. Let this Easter be the one you always remember. Pick up your cross today, dear friend, and join me as a true disciple of Jesus Christ. God's best to you. 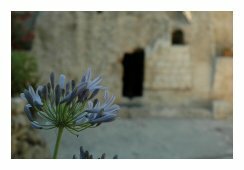 Enjoy these familiar Easter passages for your personal worship. Meditate on them, pray over them, and then recite them during your Easter festivities. "For God so loved the world, that he gave his one and only Son, that whoever believes in him shall not perish, but have eternal life" John 3:16 NHEB. "Truly, truly, I tell you, he who hears my word, and believes him who sent me, has eternal life, and does not come into judgment, but has passed out of death into life" John 5:24 NHEB. While the women were greatly perplexed about the empty tomb, behold, two men stood by them in dazzling clothing. Becoming terrified, they bowed their faces down to the earth. The men said to them, "Why do you seek the living among the dead? He is not here, but is risen!" Luke 24:4-6 NHEB. O Jesus, your life given for us is far too immense to comprehend. Holy Spirit, enter the Lord's presence for us, because we're unworthy. How shameful, such a disgrace we truly are. Ready to rescue those sinners who would return to You. Bundled in swaddling clothes, and worshiped by shepherds and kings. Betrayed, arrested, tried, and unjustly condemned. You did that all for us, Jesus, in the power of God's holy Name. so lonely, so cold, and so distant from your heavenly Home. Thank you, Jesus, you appeased our God. but, only for those who rest in Jesus' work and love. I love your Cross, because of what it means. It shows how great God's love can be. O Jesus, you paid them all, without complaint! In three days, the Spirit raised you up, King Jesus! Out from that Tomb you walked, for all the world to see! I hope you were blessed by these Easter prayers. Join one of our Easter Bible studies here: Link. Share on Facebook below and click here for a convenient printable pdf copy of Easter Prayers. Submit your own Advent Devotional or Lenten Devotional here (click): Christian Prayers. Special Note: I'm grateful to Big Book Media & Free Bible Images, wikimedia, stock.xchng, Morgue Files, and Stock Photos For Free for the use of their photos for the Easter Prayers page.